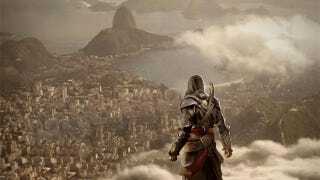 The Next Assassin's Creed Game Will Be Set In... Brazil? Ubisoft Brazil managing director Bertrand Chaverot has reportedly told local site TechTudo that the next game in the publisher's blockbuster series will be taking place in the South American nation. That's about all he says, with no further details, but GameSpot says they've verified the translation, which is interesting. You've got to wonder whether he meant the entire game would take place there, or just parts, like Assassin's Creed III, which had a single stage go down in a Brazilian train station. It's also unclear whether the "next chapter" he mentions taking place in Brazil would be a major console title or, say, a spin-off like the PlayStation Vita game released earlier this year. While we're on the subject of Brazil, the bulk of the interview actually deals with an apology from Ubisoft to Brazilian fans of the series, who were upset at the seedy portrayal of their country in that train station stage, in which everyone was dressed badly and spoke with dodgy Portugese accents. We've contacted Ubisoft for clarification on Chaverot's comments, and will update if we hear back.